This project has been in the works for a few weeks, and I finally have it ready to show you. 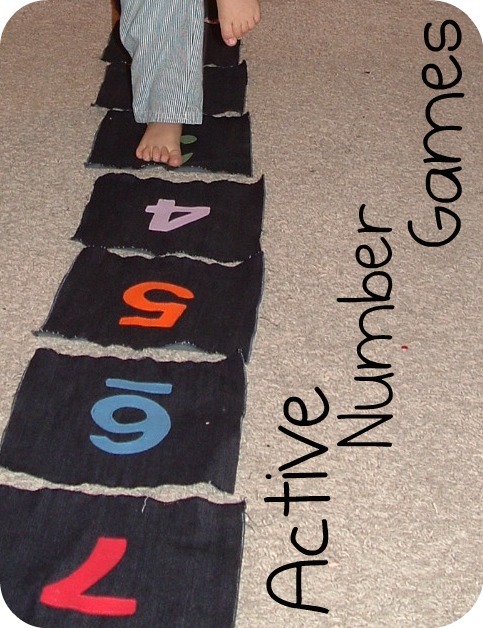 Anyone with preschoolers and kindergarteners in the house knows they love to move around and this is a great way to use that to your advantage to help them learn their numbers and colors. I saw this post on ABC & 123: A Learning Cooperative a while ago that gave a lot of ideas for using play to help kids learn about numbers. The picture of the girl playing hopscotch got me thinking because Firecracker really likes hopscotch lately. I didn't want to use paper cards, though, because they'd get ruined fairly quickly and slipping on paper is Sweet Peas #1 favorite way to slip and fall, so I decided to make mine out of fabric. I still had lots of denim left over from making Little Brother his roads and his color matching parking lot, and with all of my T-shirt upcycle projects, I've got a ton of colorful knit scraps. 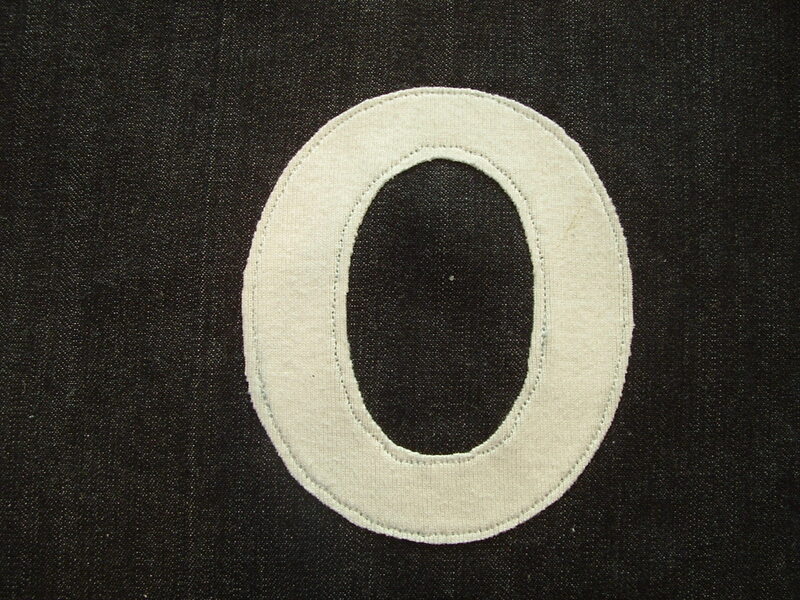 I decided to make my numbers start at 0. 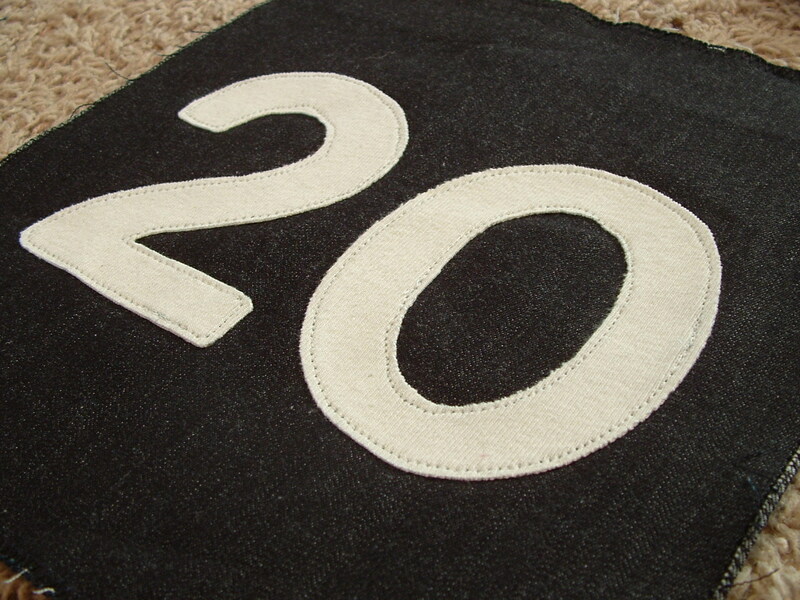 ...and go up to 20. About the same time that I got the inspiration for the project, I happened across an really great children's book at the library. 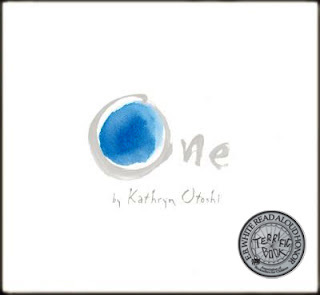 It's called One by Kathryn Otoshi. It covers colors, numbers, and how to stop a bully in a simple and striking way. I've found most books about bullying to be kind of preachy and "downers," but this one is uplifting and right-on. Blue starts out being bullied by red and because no one stops him, he starts to pic on all the colors. Then the number 1 comes along and shows them that they need to stand up to the bully. This gives the other colors confidence and one by one, they change from color blobs into numbers because "everyone counts." Then not only does red stop being a bully, but they include him and show him that he "counts too" and he becomes 7. So in honor of the book, I made the colors of my numbers match the numbers in the book. The numbers in the book only go up to 7, though, so I added a few more colors for 0, 8-9, and then we repeated the colors. 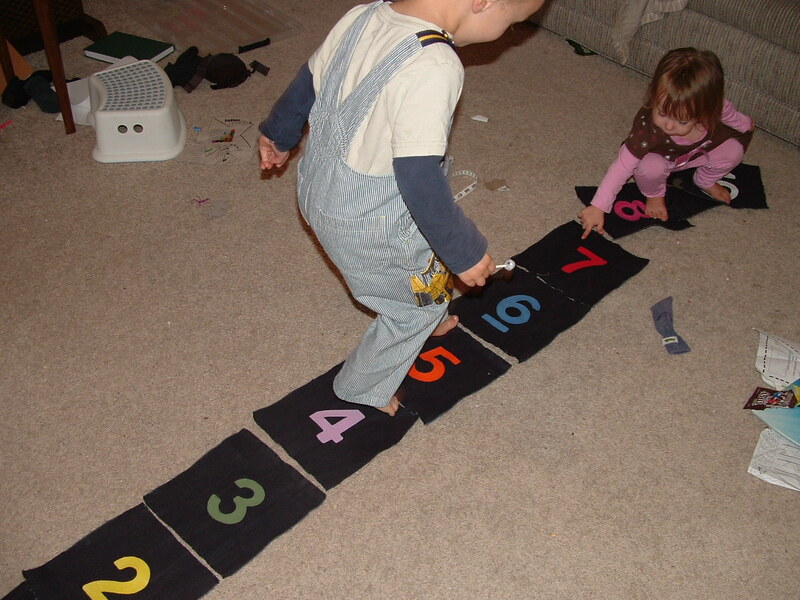 With Little Brother and Sweet Pea, I lined them up in a row up to 10 and had Little Brother count the numbers as he stepped on them. We also mixed them up, and then I called out a color for them to find. Sweet Pea isn't quite up to identifying most of the colors, but she did show partiality to pink (or maybe it was the 8s she liked.) She moved the 18 so it was next to the 8, and she could stand on both at the same time. We played with these for family night too and had hopscotch races. We also played by calling out a number and she had to go find it. 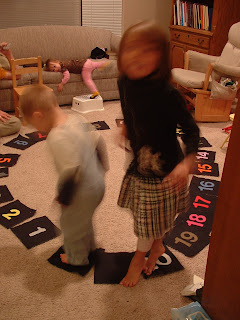 Another good way to play is to call out a color for her to find, and then once she is standing there, she has to tell me the number she's on. 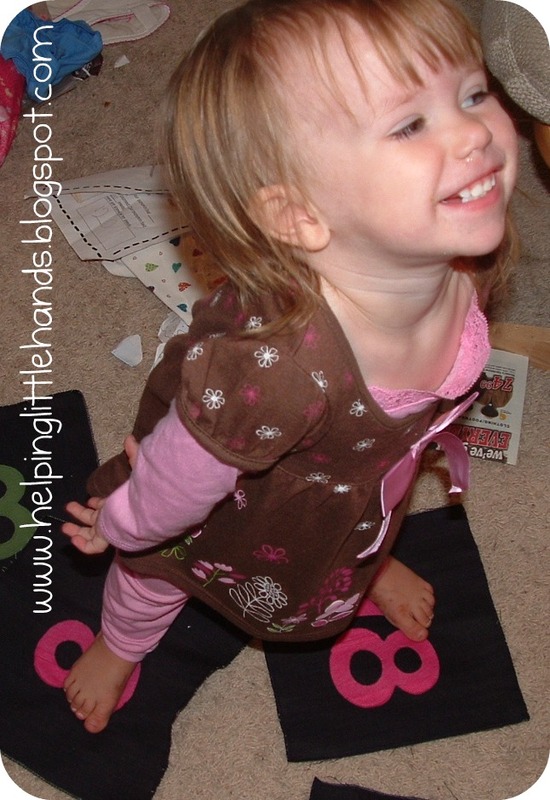 Some other things you can do is have your child trace the letters for some pre-writing practice. Or put that number of buttons (or other objects) on the number. Or just have them match colors. These are just the games I've thought of so far. I'd love to hear from you if you have another idea for how to use these. This game was a big hit with all three kids. They've asked to play it multiple times since we first did it. 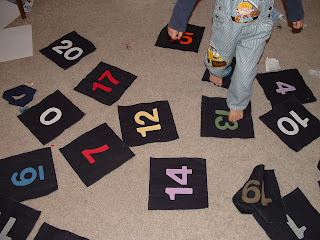 A set of these numbers would make a great Christmas gift for someone with pre-schooler or kindergarteners in the house. If you want to make your own, I used 9 inch squares of denim. Then I zigzagged along the edge to keep them from unravelling (a serger would work even better). 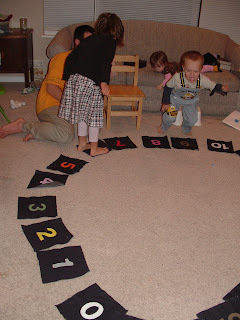 I traced the numbers from a foam puzzel set we have, but you could trace them off the computer. Just make sure you trace them BACKWARDS onto some Heat'n Bond. I used Heat'n Bond "lite" because I like to sew around the edges, but you can use the heavy duty Heat'n Bond that doesn't require sewing. 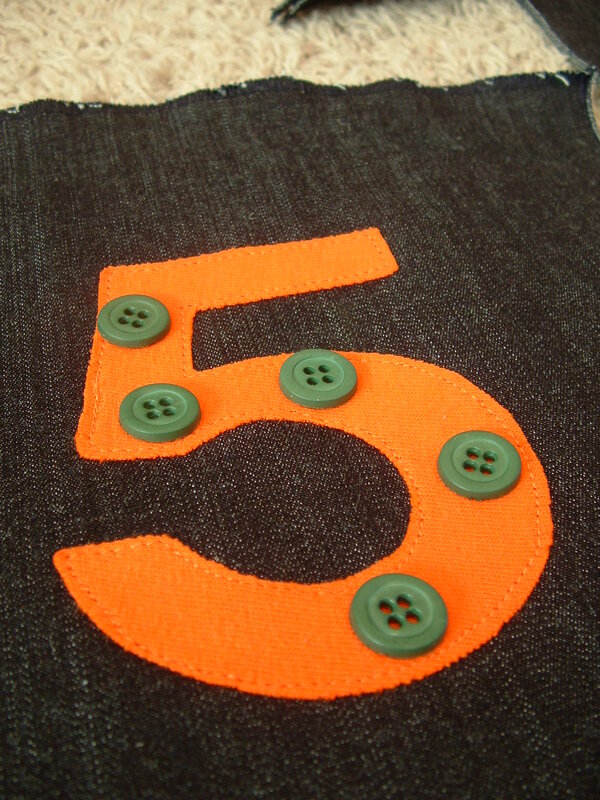 Then you just applique them on. (If you've never appliqued before, you can follow the directions for basic applique that I posted here.) I'm sure you could also use a glue gun and just glue them down as well. You could make these even easier with just felt, althougth the denim is more durable than felt would be. 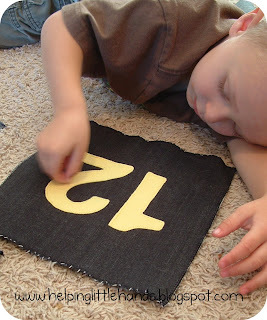 I've done this with sidewalk chalk, but I'm thinking this could be great to do in fabric as well, and think of the number line purposes for this with adding and subtracting later. I love this idea!! I have a pre-schooler,1st grader and 2nd grader. We will definitely have fun playing with these! Another idea would be to find the "even and odd" numbers. Thanks again for the inspiration! 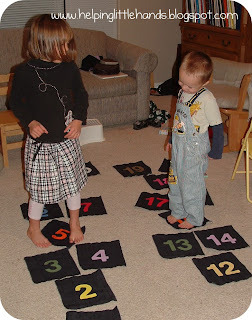 Great idea for indoor winter play. Way to go, math teacher / mom! 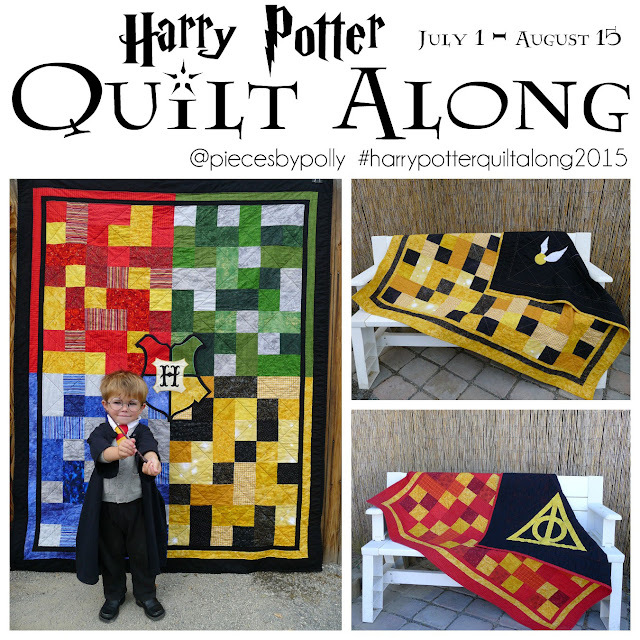 Have you considered making sets of these to put in your shop? They are a great idea! These are great! 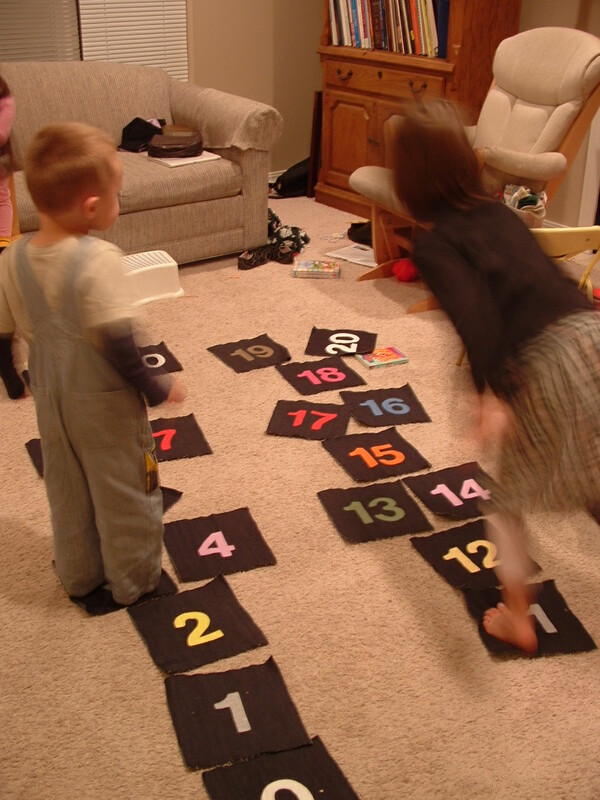 We do this with painters tape on the carpet. But your squares are much prettier. If you sold them, how much would they cost? I would want to buy a set and save myself the trouble of making them! I am so glad you left the link to your great post in the ABC comments. Your numbers turned out great and what a fun way to get the kids moving and learning! I love this! 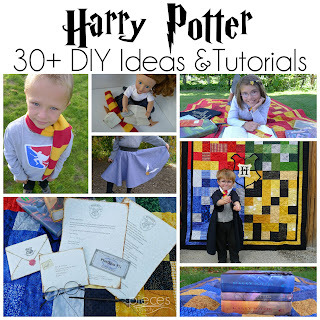 I plan to make this (after the fabric roads) for my son!. On the back of the square i will put a shape / color so its doublesided. this is going to be so fun! i cant wait!! This was a great idea. In fact, I'd been toying with this concept in my brain and couldn't figure out how I really wanted to make them. Now, I can just copycat! :) Thanks for the post. I would use them to teach SKIP COUNTING. If they start on the one, skip one, land on the next, they will go through the odd numbers. Start with 2, skip 1, the even numbers. It will really build the skills needed for addition AND multiplication down the road. 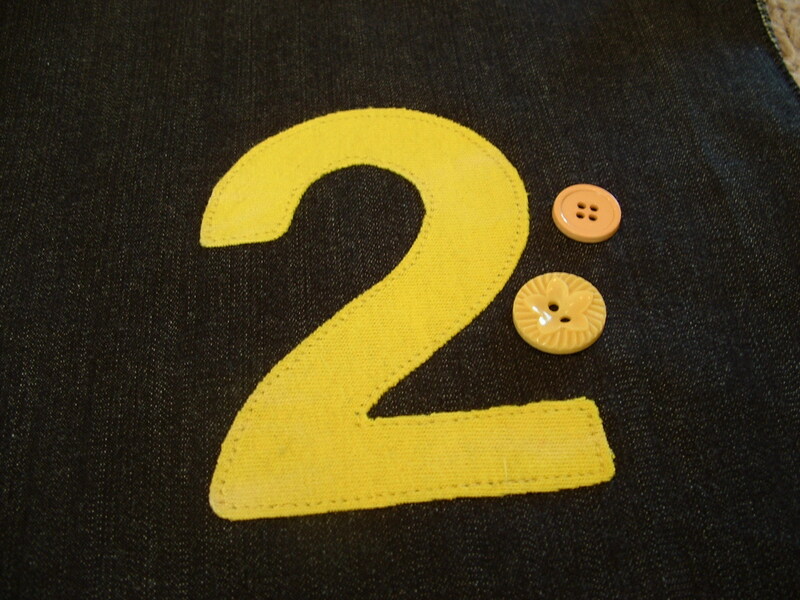 When I work with denim, I love to do a single straight stitch about 1/2 from the edge and let it unravel. If you have hardwood floors, like me, either puffy paint lines on the back or plastic shelf liner might help them from skidding. Great job!!!!!! !I'll link back when I make them and let you know how mine turned out. My children would love this. What a great idea. Thanks for the inspiration. Another genius idea! I'm definitely trying this out! I love this idea! Please link it to Read.Explore.Learn. Oooh that's a great idea. I have a bunch of upholstery samples that I think might make a good base for these; I've been wondering what to do with them. This is great Polly! I totally want to make a set of these for Olivia. I am using the button counting with my son, he likes to count to 20 this way! Great game! Can't wait to try it out!